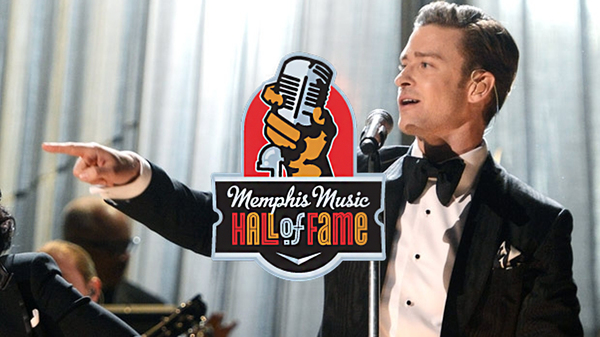 Alongside Memphis blues legends, rock 'n' roll innovators, and soul and country icons, Justin Timberlake will be inducted into the Memphis Music Hall of Fame on October 17th at the Cannon Center for Performing Arts in Downtown Memphis!! In the Hall of Fame’s fourth year, the inductee list is as diverse as ever – blues singer-songwriter Alberta Hunter, “The Human Timekeeper” Al Jackson, Jr., bluesman Memphis Slim, pioneering rock guitarist Scotty Moore, acclaimed country artist Charlie Rich, legendary soul duo Sam & Dave and Actor and Singer Justin Timberlake – and they join 47 previous inductees including B.B. King, Elvis Presley, Big Star, Chips Moman, Carl Perkins, Sam Phillips, Otis Redding, Jerry Lee Lewis, Johnny Cash, Howlin’ Wolf and other world-changing musicians, bringing the total number of inductees to 54. Tickets will be available for purchase through Ticketmaster.com, or by calling 1-800-745-3000. Tickets are $50 or $100 per person and are inclusive of Ticketmaster fees. The ceremony will begin promptly at 7 p.m. Additional information is also available by contacting Pam Parham at the Memphis Rock ‘n’ Soul Museum at (901) 205-2530 or at [email protected]. Really great news for us! And janisha I don't think he's done. Justin's a perfectionist and it may take him a while to get the sound right so I'm sue you'll be able to see him. Plus don't forget there are always contests on the radio when he comes to your area so just be on the look out. I had the best time ever!! such an amazing experience it was the whole road trip! the whole ceremony was amazing, justins speech amazing, the performances amazing, just everything was amazing!! so happy I was able to be there & so proud to call myself a #TNKid!! congrats Justin!! you deserve everything!! ilysm! It was amazing!!! I wasn't there love but saw Justin's 30 min speech and he sang Sittin'on the Dock of the Bay. I love his speeches!! This beat the Iheart speech!! How sweet is he!! The parts about Jess, Trace, and his mom!! Jimmy Fallon is presenting this to Justin!!! Yesss!!! I was so close to being able to go but my coworker couldn't switch with me :-( oh well it's ok I'll be in Memphis with the fam next month. Congratulations Justin!!! What an exciting time in your life. Please...please...please keep being creative, funny and fabulous. Keep making music that inspires, touches and influences the world. Have a GREAT night. God bless you and your family.